Starring in a string of blockbuster comedies and stand-up specials has really paid off forKevin Hart! The hard-working comic topped Forbes’ list ofthe world’s highest-paid comedians, earning a reported $87.5 million between June 1, 2015 and June 1, 2016. 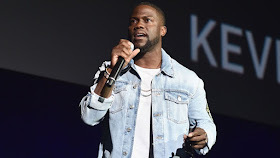 Hart, who has starred in the surprise hits Ride Along, The Wedding Ringer and Central Intelligence in the last few years, has actually made most of his money by “touring like a rockstar,” according to Forbes. The 37-year-old father of two has played over 100 live shows this year alone, and often sells out stadiums and arenas, as opposed to comedy clubs and theaters. The accomplishment is made even more impressive by the fact that Hart has become the first comedian to ever earn more than Jerry Seinfeld since Forbes first began compiling the list almost a decade ago.